Camp Administrator: Hugh Williams, Bill Abel, Pete Best, Fred Doyle, Olly Graham. It was all Bot's idea in the first place. At the Conference in January he got us all going with the crazy idea of organising our own expedition to Vatersay (none of us knew where it was). Things eventually started happening and after numbers had dropped from ten to five and then increased to six again we very nearly gave up. 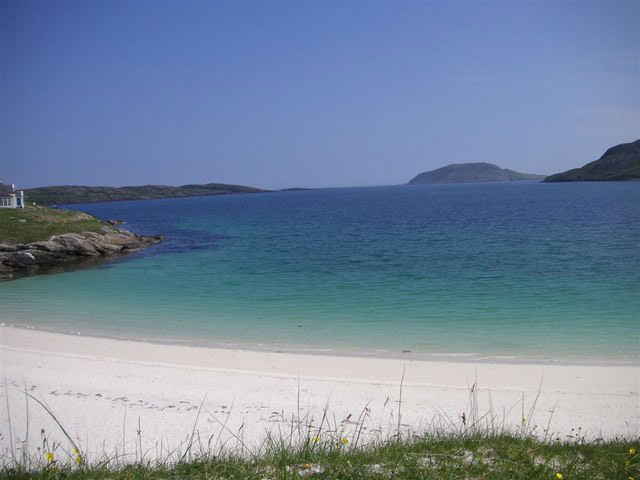 However, we persevered and eventually, at the end of August, found ourselves on one of the most beautiful Hebridean islands which I have ever seen. Vatersay is just south of Barra (the ferry from Castlebay takes about twenty minutes) and is the most southerly inhabited island (population: 80) in the Outer Hebrides as well as having the most westerly inhabited house (barring the army radar station on St. Kilda) in Great Britain (though not Northern Ireland). The island is formed of two rock outcrops running east to west with a "neck" of sand about five hundred yards wide and a mile long joining the two in the middle and on which we camped. Five beaches facing north, south, east, west, and north-west gave plenty of variety but all were deserted in strange contrast to those muddy stony ones in Italy where Fred had been a few weeks before and where every inch was covered in baking humanity! Come to the Riviera of the north for your holidays! I met Hugh at 6.30 on Monday, 19th August in Oban and after a rough crossing on the Claymore we arrived to find Castlebay windswept and wet. The weather prevented Hector MacLeod from running his regular ferry to Vatersay and so we had to spend the night camped in Castlebay. The same bad weather which hindered us had also caused a disaster which affected us very closely. When visiting the island at Easter, Angus John MacNeil had acted as ferryman and had been very helpful. Alas, just before our arrival his boat, on a trip to Mallaig had been lost in a gale and all five crew on board, all from Vatersay, had lost their lives. This tragedy cast a shadow over the island but the islanders nevertheless made us very welcome in their midst. For the first three days the weather remained wet and windy and we were not helped by the absence of the marquee, stranded at Northbay Airport. After the other four had arrived on the Wednesday we decided to move our site to a more sheltered spot nearer the schoolhouse. Here we had a well drained site right beside the road which meant that there were no problems with stores and mail. by the Lochs Land League. 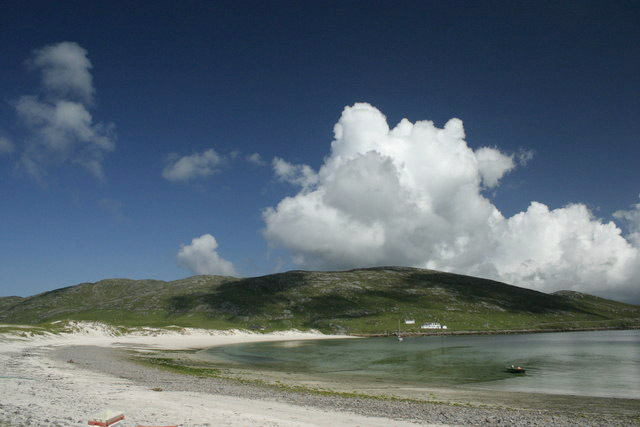 Vatersay was the first island to throw off the yoke of the tenant farmer whose house can still be seen, in ruins, above the village. Playing cards was our main evening activity. I never want to play Solo, Whist or Black Maria again. We arc claiming another S.H.S. record for playing Black Maria (we had another name for it) for twelve hours nonstop (10 p.m. to 10 a.m.). Playing cards was our main evening activity. I never want to play Solo, Whist or Black Maria again. We arc claiming another S.H.S. record for playing Black Maria (we had another name for it) for twelve hours nonstop (10 p.m. to 10 a.m.). 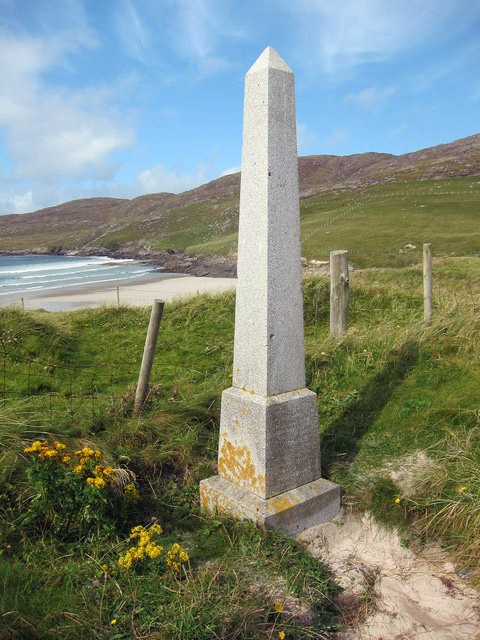 ON 23RD SEPTEMBER 1853 THE SHIP ANNIE JANE WITH EMIGRANTS FROM LIVERPOOL TO QUEBEC ABOARD WAS TOTALLY WRECKED IN THIS BAY AND THREE FOURTHS OF THE CREW AND PASSENGERS NUMBERING 350 MEN WOMEN AND CHILDREN WERE DROWNED AND THEIR BODIES INTERRED HERE. Perhaps this small service will in part repay the islanders for all their help in time of another great tragedy, with the loss of the "Marie Dhonne" in the Minch. In particular our thanks must go to Mrs. Campbell, the schoolmistress who lent us everything from a dustbin to methylated spirits and in whose house we had many a cup of tea. I would also like to thank Mr. MacQueen at Oban High School, McCulloch's in Oban, the S.C.W.S. Castlebay, Hector MacLeod the ferryman and Donald Campbell the postman as well as Mr. S. L. Hamilton of the Ministry of Agriculture, Fisheries and Food for Scotland who gave us permission to use the island. 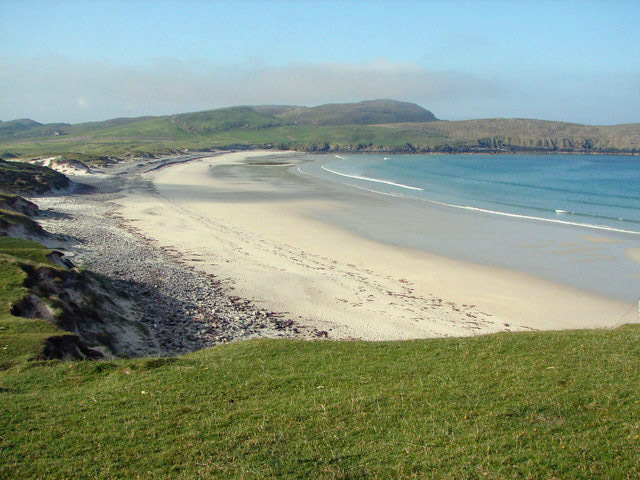 The expedition suffered from being too small in numbers but apart from this it was successful and I enjoyed myself and intend to return to Vatersay someday soon. THE CAMP After a few days on Vatersay we managed to find a camp site which was ideal in most respects. The soil was sand, the surrounding dunes sheltered us and, when it rained, the hills provided water. We were very close to the sea, there being two magnificent shell-sand beaches on either side of our site. Apart from our lack of numbers (only six) and the fact that two people had to leave early, our greatest disadvantage was our closeness to civilisation. Our glorious leader (quickly renamed John B. Dob Mk. II) was frequently to be found in local houses, sitting down under the excuse of sociology, drinking tea or anything stronger that was offered (just jealous, that's all—P.N.R.). The camp set-up was good. The marquee was divided into two parts, one for preparing food and the other for playing cards in the evenings, drinking coffee and eating (in that order!). Use of gadgets (self-emptying ash-trays, mug racks etc.) made camp life much easier. When all is taken into account the expedition may have left something to be desired but it was certainly an experience, and a most enjoyable one at that!